Fuse holder refers to the seat used to Fuse& Fuse Holder install fuses. Fuse holders can be divided into: panel mounted fuse holder, PCB mounted fuse holder, lead type fuse holder and automobile fuse holder; panel mounted fuse holder (mostly used for electrical equipment, such as power amplifier, DVD, Speaker,Plug-In Fuse Holder massage chair and other electrical equipment); lead type protection. Fuse holder (mostly used for the connection of small household appliances and industrial machinery harness); PCB fuse holder (mostly used for small Middle Type Fuse Holder household appliances control board) and fuse clamp (mostly used for small household appliances control board). Automobile fuse holder can be divided into lead Fuse Holder type automobile fuse holder (multi-purpose automobile and industrial machinery harness); panel mounted automobile fuse holder (mostly used in automotive appliances, such as automotive power amplifier, automotive refrigerator, automotive DVD, etc.) and automotive fuse holder. Looking for ideal Horizontal Insulated Fuse Holder Manufacturer & supplier ? We have a wide selection at great prices to help you get creative. 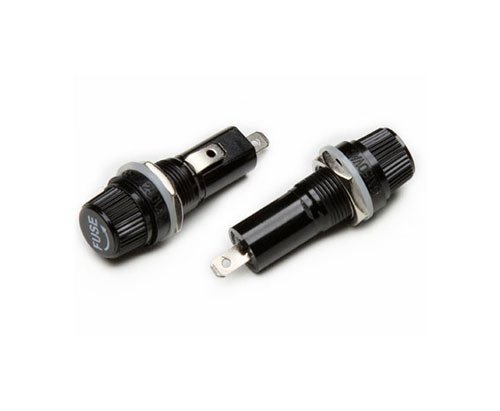 All the Bicyclic Fuse Holder are quality guaranteed. We are China Origin Factory of Glass Fuse Cover. If you have any question, please feel free to contact us.